As educators, we have been blessed with an awesome responsibility to educate the whole child to become productive citizens and leaders of tomorrow. As an administrator, one of the blessings of my job is to help my faculty and staff be the best they can be in the lives of those placed in their care. *to remember that as an educator, we are the rational adult called to model behaviors for our students…forgiveness, flexibility, humor, compassion etc. Never underestimate the power we have in lifting up our students to new heights…if you BELIEVE they will ACHIEVE! As we celebrate our third year as a company, we have much to be thankful for. We have been blessed to have met wonderful people and companies via Twitter and Facebook and this blog, that have an amazing impact on education like Ocean House Media, @Pragmaticmom , @MovingSmartNow, and Writers Digest to just name a few. Fortunately, we have been asked to provide professional development numerous times throughout the school year these last three years and we have almost reached 35,000 views on this blog and our website receives thousands of hits per week…thank you! More recently, we have struck up some good dialogue with people in the publishing industry who are giving us good advice and recommending agents for us to seek out for our Unlock the Teacher series we have been collaborating on with Dr. Lick, M.D and Dr. Letscher, Ph.D. We are quite grateful for all the advice and recommendations…thank you! As we prepare for this Thanksgiving holiday, we want to say we are THANKFUL to each and everyone one of you, who allow us to do what we love and encourage us to do more. May your holiday be blessed! Below are some great sites to utilize for summer learning! Gobstopper is a free tool for assigning,aonitoring and leveraging summer reading in the classroom. As students read, they will see questions and get feedback, and they can stay motivated by earning badges. Teachers can use the tool to assign books, check on students’ progress throughout the summer and even benchmark data on students’ mastery of Common Core Standards before the start of the new school year. The tool can be used on all devices that have a browser and Internet access. GeoSettr helps you create your own GeoGuessr games. When you visit GeoSettr, you will see two screens: the one on the left displays a map with a Pegman; the one on the right, the Street View imagery for the Pegman’s current location. Move the Pegman around, and zoom in if you like, until you find the location that you want students to guess. When you’ve chosen the location, click “set round” to save the location. After you’ve set five rounds (locations), your game is assigned a URL that you can distribute to students. When they play your GeoSettr game, students use the visual clues in the Street View imagery to guess the location. After making a guess, students see the correct location and its distance from their guess. Fotonauts’ free Fotopedia National Parks app for the iPad, iPhone and iPod touch lets users explore all 58 National Parks in the United States—from Acadia to Zion, including Yosemite, Yellowstone, Grand Canyon and Glacier National Park—a journey that would require several years. Users will first discover the diversity of the national parks through a selected set of 1,500 photos; then they can dive into specific parks to find even more photos. The collection includes 3,000 stunning photos by the renowned professional photographer QT Luong, along with photo-stories based on the images of the national parks. In addition, each image is linked to a related Wikipedia entry. The app is available in 10 languages. AndAR Model Viewer is a free Android app that is capable of displaying 3-D models on Augmented Reality markers. The goal is to help young students better understand the differences between shapes such as cones, cubes and squares, a Common Core math requirement. It helps build students’ spatial reasoning—they can zoom in on these objects and interact with them in the virtual space—and it gives students an understanding of what these objects look like in real life. The National Museum of Mathematics (MoMath) opened in New York City in 2013. The museum’s exhibits and programs aim to stimulate inquiry, spark curiosity and reveal the wonders of mathematics. As part of its commitment to provide engaging, interactive mathematical experiences, MoMath has created Math Midway, a hands-on traveling exhibition that highlights the engaging and playful nature of mathematics. The Math Midway is making appearances at science and technology centers across the country. Australian architect and paper artist Horst Kiechle recently constructed a geometric paper torso complete with modular organs, including lungs, intestines, kidneys, pancreas stomach and more. The piece was made for the Science Lab of the International School Nadi, Fiji. On completion of the model, Kiechle launched an extensive website with free downloadable templates you can print and assemble, along with photographed step-by-step instructions for every piece. GlacierWorks, Microsoft and mountaineer/filmmaker David Breashears have collaborated to develop Everest: Rivers of Ice, a new interactive site that takes visitors on a virtual trek to Mount Everest base camp. Virtual travelers make eight stops along the way to base camp. At each stop, they can explore panoramic images of valleys and glaciers. After completing the virtual trek, they can compare the size of Himalayan glaciers in the 1920s to the size of those same glaciers today. GlacierWorks’ mission is to document, educate and raise awareness about changes to the glaciers in the Greater Himalaya through art, science and exploration. Our Unlock the Teacher LLC team has been very busy writing but we are always on the lookout for great educational resources to share. Below is a list of A-M-A-Z-I-N-G online virtual tours that parent or teacher can utilize as a curriculum resource or for some learning fun! Please check them out and let us know which tour your child(ren) or students liked best. 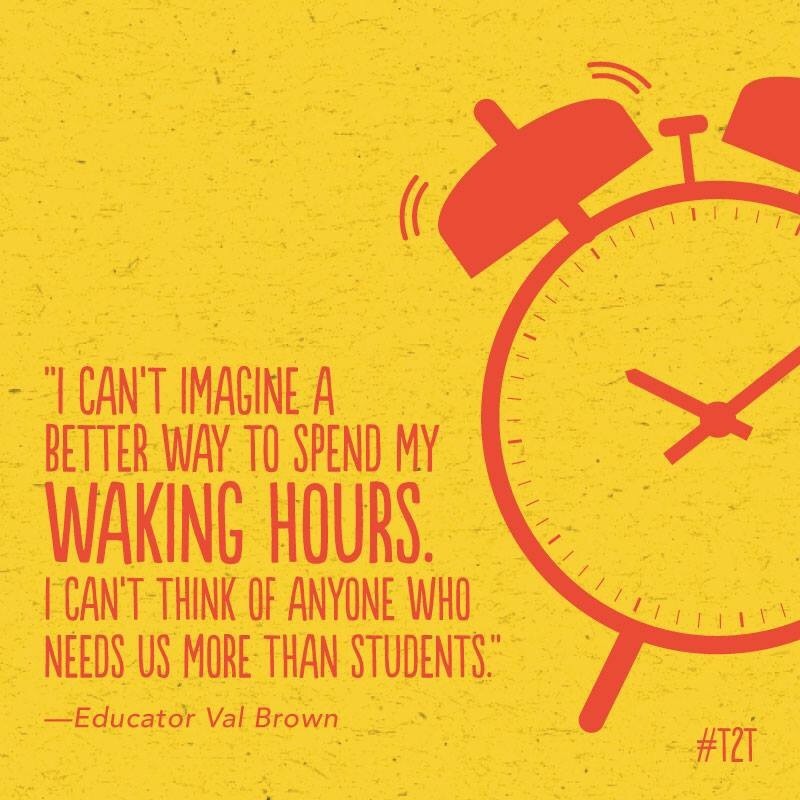 When we all come together and share best practices, it is our students, our future who benefit. Smithsonian National Museum of Natural History – Each floor and exhibit is a virtual tour. SEA WORLD – This site allow you to visit Seaworld photo’s, videos, virtual tours of every species at seaworld. Pottery Museum – Take your class through a Virtual tour of the pottery Museum. Monet – This guides you through a biography of his life. Metropolitan Museum of Art – You can take a virtual tour of the museum, you choose what you what to view. The White House – Take a tour of the White House. Art, architecture, Furnishings, See rooms like the oval office. Countries of the World – A lesson for Social Studies. Colonial Life – How did early Americans live? Baking Bread~ A Virtual Field Trip for your math class – This Virtual Field Trip teaching 4-6 grade students measuring concepts. Max’s Math Adventures – A great collection of Virtual field trips for your K-2 grade classroom. Endangered Species~ A Virtual Field Trip for your science class – This virtual field trip teaches 5-8 grade students about endangered species. Having written my thesis on phonics, I found this book a good and reflective read. I am still a believer in the importance of phonics in the classroom and at home but I am and feel we as educators must be, open to others views and opinions. I learned a lot from this book and highly recommend it for your summer “must read” list. The next book is an excellent read and has sat in my office on my book shelve for a couple of years now. I have lent it out many times now in hopes that it might inspire those who read it to refuse to give into the easy path and CHOOSE to be the difference in the life of our children…our future! Our Unlock the Teacher team has talked on this before on how we feel ALL children are capable of learning. I know many have heard me tell the story of when I taught in the city and I was told that my students could not or would never understand Shakespeare, so I should not waste my time. Well, not only did my 8th grade English/Literature students learn all about Shakespeare, The Tempest became one of their favorite reads that year. Much of how our students respond in our classrooms or buildings depends most on how we choose to approach our environment and communicate learning expectations. I highly recommend this book for all educational staff and parents too! Dumbing Down Our Kids is a searing indictment of America’s secondary schools one that every parent and teacher should read. Dumbing Down Our Kids offers a full-scale investigation of the new educational fad, sometimes called “Outcome Based Education” the latest in a long series of “reforms” that has eroded our schools. -How parents, students, and teachers can evaluate schools and restore quality learning. If you have a good book to recommend or your staff has chosen a book to read as a team, please share and together we can learn from each other. It is in the collaborative process that we will make a difference for our children of today and the future of tomorrow. As a company which celebrates the gifts of each individual, we wanted to take time to recognize all those with autism that contribute to the greater good! We believe that when we share the good in each other, amazing things can happen! Great pictures of nature…take a moment and calm your spirit! Delay, delays, so this and the next is a bit of catching up. I’ll work from most recent to earlier in the year. We work the Seattle’s Fremont Market every Sunday. Ian goes every week, I go on the first Sunday of the week (it’s a 2 1/2 hour drive, but it’s our best market). It works – Ian hates doing internet work, I hate rising at 3am… To each their skills at our farm. Glacier, Washington : Hopeful skiiers head for Mt. Baker in the driving rain. Water falling in mass off a broken gutter onto the speckled pavement creates an abstract pattern that caught my eye. It’s dark, it’s wet, it’s cold….getting desperate here…. 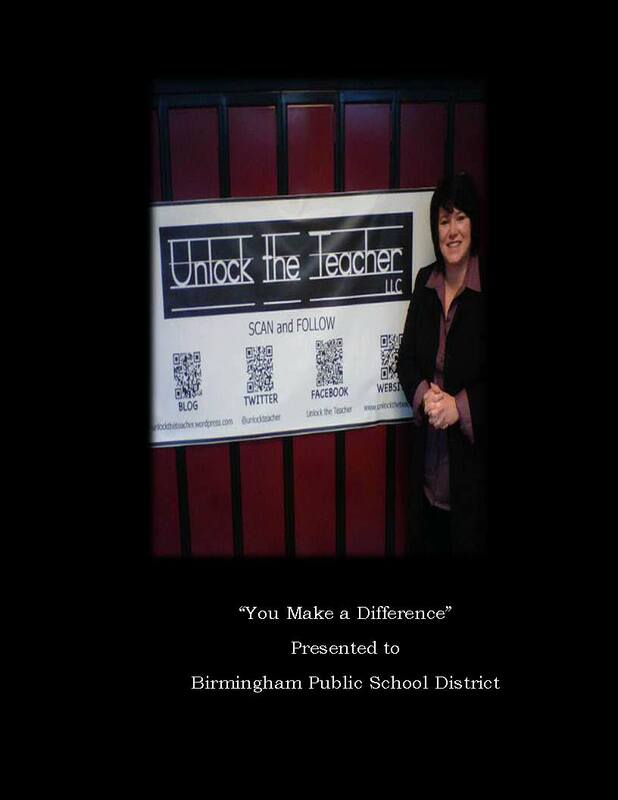 Unlock the Teacher was asked to present at Birmingham Public School District’s MLK Educational Training Conference. The district invited over thirty presenters to come in an speak on various topics. The entire educational staff for the district was then able to look at all presentations being offered, and choose two to add to their professional development plan. As educators, we pass on wisdom/skills by modeling the expected behavior. Of course, all the wonderful educators present today new the importance of these tips but sometimes even the most qualified and most dedicated teachers need reminders… and these teachers were positive and a joy to present to. 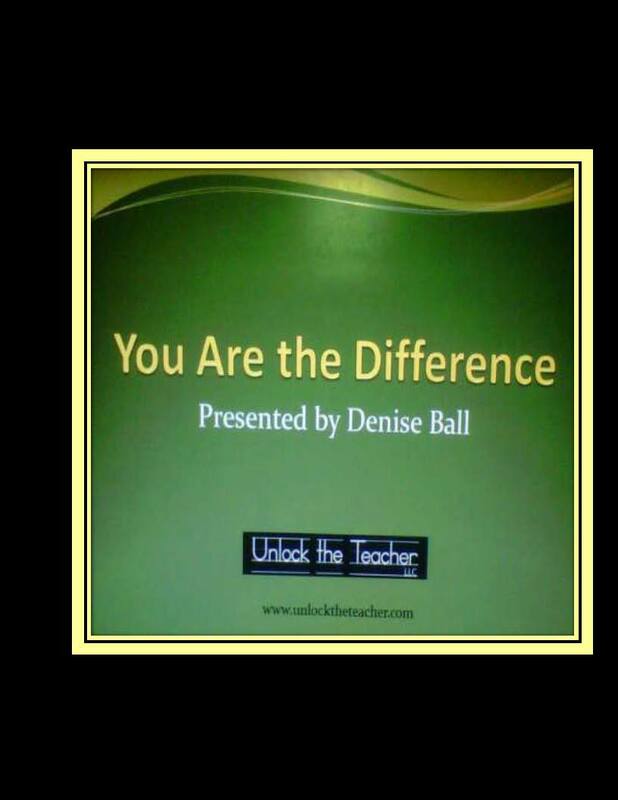 Denise Ball presenting "You Make a Difference"
Unlock the Teacher’s Chief Financial Officer, Trisha Vaughn had a beautiful baby boy this week! We are so thrilled for her and her family. Colette now gets to be a big sister to Chaston, who no doubt will bring joy to entire the Vaughn household.